At the same time, to characterize the Court’s decision as merely an “inability to decide” misses something consequential and troubling about that disposition. It is not merely the case, as Jack Chin and other legal observers have understandably lamented, that the Court “missed an opportunity here to give some guidance” on the controversial legal questions before it—which of course it did. Nor is it only the case, as Walter Dellinger has powerfully observed, that with the lives of millions of U.S. citizens and non-U.S. citizens at stake in this litigation, “[s]eldom have so many hopes been crushed by so few words”—about which he, too, is unmistakably correct. In addition, by affirming the legally flawed and deeply politicized lower court decisions blocking the Obama administration’s immigration initiatives—the substance of which I have previously discussed in several essays for Dorf on Law (here, here, and here), an essay for Yale Journal on Regulation Notice and Comment, an essay for Washington Monthly, and an article in the UCLA Law Review Discourse—the Supreme Court’s decision necessarily embraces modes of legal analysis and adjudication that the Court should have openly and decisively repudiated. 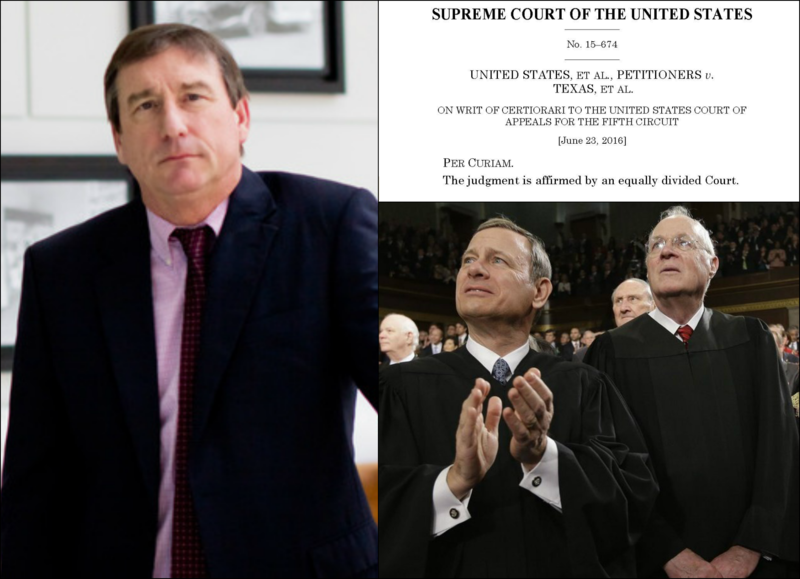 And by doing so instead under the cover of an opaque, unsigned opinion that reports only the bare fact of the Court’s stalemate, the four justices who voted to affirm those decisions—presumably Chief Justice Roberts and Justices Kennedy, Thomas, and Alito—obscure their own roles from public scrutiny at the expense of transparency and accountability. (Which, as it happens, are among the very rule of law values that the Obama administration’s immigration initiatives themselves, by contrast, actually help to promote.) Both the continuities with and the contrasts to what has been transpiring in the political process this year are striking.